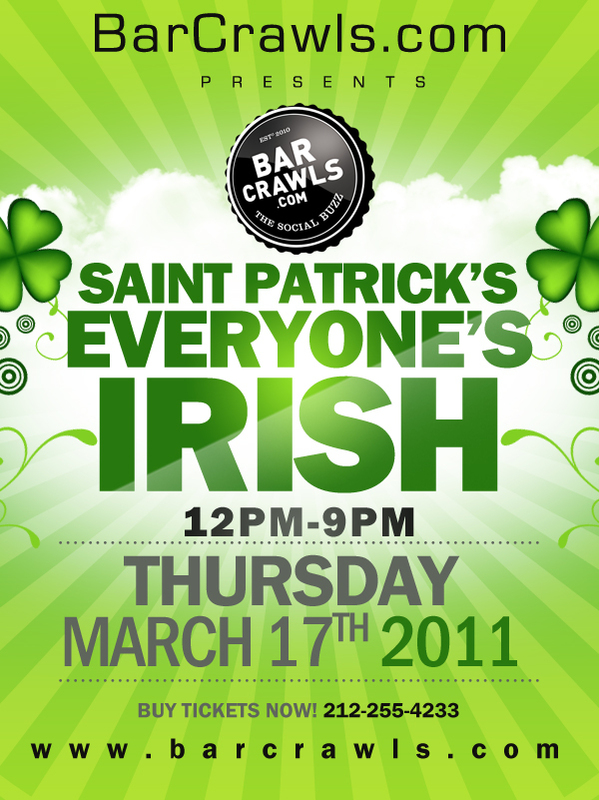 New York’s Fifth Avenue has its St. Patrick’s’ Day Parade and so does Barcrawls.com. On Thursday March 17 everyone is Irish and everyone is on holiday. Excuse yourself from your normal day’s work, gather the whole gang and head out for The Official Bar Crawl for Saint Patrick’s Day on the Eastside stretching from midtown, through Murray Hill and ending in Gramercy. Put on your Irish Barcrawl.com T-Shirts and join the merrymaking. The celebration starts at noon, at three registration sites … Joshua Tree 513 third Ave, New York, NY; McFadden’s Saloon 800 Second Avenue; NYC, Turtle Bay 987 Second Avenue, NY, NY. Still time to purchase advance sale tickets at the best prices or come on the day of to any registration site. ← WHAT IS A MERITAGE WINE?